I am an intimacy addict, I think. As I trudged through this time in my life, I have been treated to some introspection. I believe we all have a God Spark. I think we are all given a Spark that set the foundation of who we are. IT is warm and attractive. It glows and seeks to unite with other Sparks. Its job and function is to relate to others, ourselves, and God. As soon as we are able, we start to hide it. IT makes us feel vulnerable to have it exposed. People seek to extinguish it. It is fragile, but real and so we protect it. WE hide it under Shame. We bury it under Hurt. We choke it with Fear. WE escape it with addiction. I had lost my God Spark. It wasn’t ever out, it cant be, but I couldn’t see it. I didn’t think it existed. I had hid it so well, escaped it so thoroughly, lied about it so completely, I didn’t recognize it anymore. And since it didn’t match what I had lied about, I didn’t respect it when I saw it. However, the Spark was there, clamoring to relate. It wanted interaction with its true self. I lied about what it was and sought interaction. I wanted intimacy and affection, but had no idea how to get it. MY ex-wife had learned to relate to my mask with her own mask. When I tried to take mine off, I broke the rules of our interaction and the rest is history. I texted women outside my marriage. I rationalized hat it wasn’t physical, but it was still cheating. I have no real excuse except for I just wanted my Spark to feel warm again and I hadn’t learned that I was actively trying to snuff it out by holding onto my Shame and Fear. I had been working on my escapism and didn’t have that defense mechanism anymore, and so was left confronting my heart and soul and mind. I found them freezing to death for lack of the Spark. I pray for connection. I work on intimacy issues. I avoid addictive relationships. I am learning to be intimate with myself and to really love myself completely. I am up to a strong like. My prayers were answered in a very different way recently. I saw what it feels like to learn that someone you love is working on affection to another person. I needed to know how that seems to lessen the honesty of my words. I felt the pain of knowing that I might not be the last good night or the first good morning. I needed to know that connection to a loose wire is difficult and exhausting. I understood that I am not more wonderful, but just as wonderful. I need to remind myself that I am not too big or too small. I am just me. We all have a God Spark and mine is one just like everyone else, but also wholly different. I felt the loss of deep intimacy for a lesser version. Not any less real, but less central to my core. I needed to know that connection is a life force. It is who we are and who we are meant to be. The connection is more important to protect and honor and respect. I needed to know to give it away delicately and with purpose. I learned I am not special and that I am special. I am not the end all be all, but I am uniquely myself. When I uncover that Spark, I connect very well. I delight in me and in the Spark I share space, time, and warmth with. I hurt and I am lonely. I am growing. Melt me, Mold me sounds painful, but wait until you experience it. I am tired. I am lost. I have learned a multitude of lessons in the last few years. I am being prepared for something wonderful, I hope. I wont let myself get stuck in a mask tete a tete again. I seek intimacy…true intimacy. With me, With God, and with another. 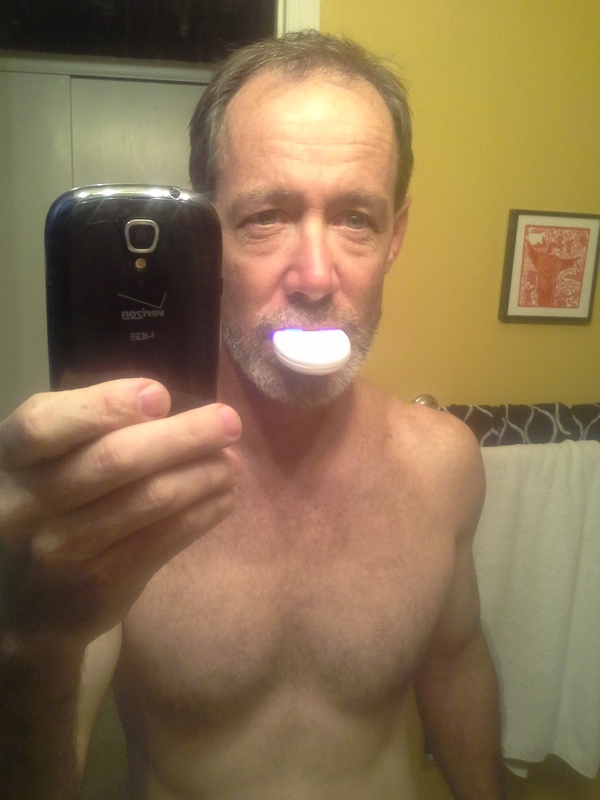 It isn’t that I have a glowing mini space machine in my mouth. It isn’t that I have plastic trays with some sort of goo in them in my mouth. It isn’t that I painted the walls yellow. Nope, my problem is that I thought of those were good ideas. I looked on the internet and saw a teeth whitening machine and thought to myself…”Yeah, that looks great.” I ordered it. I prepared the trays. I squirted goo, Eagerly, I put them in my mouth and then turned on this purple light and slid it in my mouth. Then I quickly ran through my house, past the yellow walls, into the spare bathroom with more yellow walls, and took a picture. Yep, I have a problem. This better work. I drive a school bus. This means I am up VERY early. The benefit of that is I get to see some pretty spectacular sunrises. I have always been pretty curious with the idea of some of the vernacular around the new day/dawn. “Tomorrow will be another day.” (profound, isn’t it?) “You are starting a new day, a new chapter in your life.” “It’s always darkest before the dawn.” Fascinating thing. The Dawn celebrates a new beginning. It calls to the cosmic “Do over” that we get to call when the game isn’t quite as planned. Dawn relishes in leaving the darkest dark behind. Dawn rejoices in light and color. This morning the sunrise was pretty spectacular. The color was amazing. IT got me to thinking about what it takes to make a good sunrise, and my conclusion was it is clouds. Not excessive, but a smattering of clouds. I personally like the extended wispy clouds in my sunrises. If the Dawn is the new day, the clouds are the difficulties from the day before. If we avoid our problems and don’t clean our slate at the end of each day, the cloud cover will prevent us from really seeing the light and color of a new start. My analogy breaks down when there are no clouds, but since I don’t really think that life exists without some difficulties, I will ignore that. The wonder and joy comes in celebrating each day like a new introduction to an old friend. I just saw an ad for glow-in-the-dark pull-ups. This is brilliant. So often I wanted my kids to stare at their crotch. It is important to develop the skills for when you get older and experience dribbling and need to do the check as you leave the restroom. I wonder if they make adult diapers with glow in the dark pictures. It might not be the greatest idea to wear white anymore…I mean, glowing pictures of superheroes on your crotch in a nightclub might be a turnoff. The commercial got me to thinking about other things that should be glow-in-the-dark. The obvious is glow in the dark condoms, like in the John Ritter movie. I have some concerns with those actually. It would seem that the goal of those would be to not see them, right? I am not sure I can fully support creating something to glow when it will be stifled. I thought about glow in the dark bike parts. It is fraught with the same concern. Generally, when I bike and it is dark, it is because I made an error. So, the glow wouldn’t be seen as often as is warranted. I think I would like glow in the dark eyeballs…just the white part.